A mile and a half south east of Port William the main A747 along the shore of Luce Bay makes a turn it the left as it rounds Barsalloch Point. On the top of the 100ft sea cliffs immediately inland from the road is Barsalloch Hill Fort. 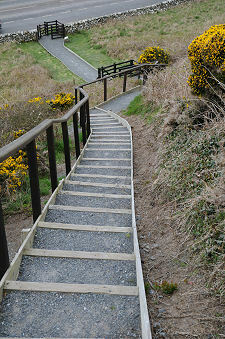 Access is via a superbly crafted set of wooden steps that climb the cliff from a layby that solves the parking issue. Barsalloch Fort is what is technically known as a promontory fort as it occupies the tip of the headland above Barsalloch Point. At the top of the steps from the road you find yourself in a magnificently preserved steep sided ditch some 10m wide and 3.5m deep, with another short set of steps to your left giving access to the main body of the fort itself. Barsalloch Fort is rather irregular in shape, but measures approximately 44m from north to south and 42m from east to west. 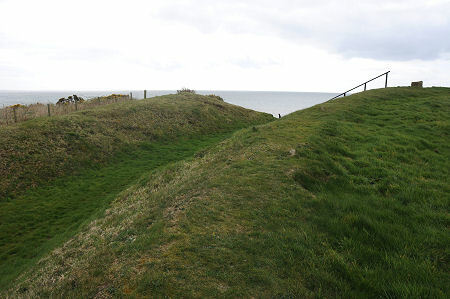 The defensive ditch is reinforced by ramparts that in places are up to 2m wide and 1.1m high. The term "fort" gives rise to mental images of a military installation. In fact Barsalloch Fort probably housed a farmstead or village that was home to one or two extended families. Several similar sites are known in Dumfries and Galloway, including the rather larger example at Rispain Camp near Whithorn. 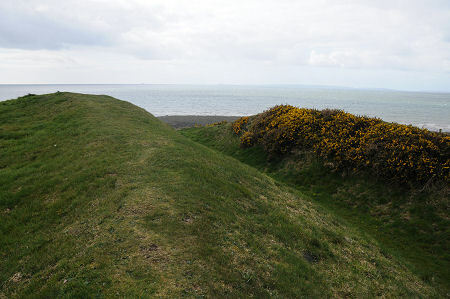 Because of the fort's location on the edge of the sea cliff, there was no need to construct defences on the seaward side. Those on the remaining three sides of the site are mostly in very good condition, though on the north east side a later field bank and track have obscured the original ditch and defences. There is no obvious sign of an entrance to the fort, and it may be that it lay in the area obscured by later farming. Barsalloch Fort has never been excavated, and this gives rise to much of its attraction as you wander around the site. Archaeology has been described as an essentially destructive process. Once a site has been excavated, more is known about it but something else is lost. At Barsalloch the very lack of hard knowledge keeps open a range of possibilities and it is fascinating to wonder what still lies under your feet, to be discovered by later generations.